Did anyone figure out why the cricket was pale in color in last week's post? The answer was that it had just shed its skin or molted. Newly molted insects are often pale in color until their exoskeleton hardens up. This week's insect is a bit mysterious as well. When I worked for The University of Arizona, part of my job was answering questions about insects and plants. I was always getting the question, "What's this white fuzz on my plants?" The answer is that a tiny insect called a cixiid (family Cixiidae, pronounced roughly six-ee-iday) in the planthopper group has laid its eggs here. The female insect inserts her eggs and then covers them with a whitish waxy fuzz. The reason you don't see the immatures is because they fall to the soil when they hatch from the eggs. The nymphs burrow into the soil where they feed on plant roots. Does this sound familiar? 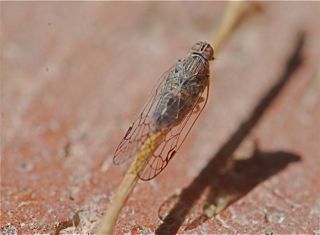 Their life cycle is similar to that of cicadas. In fact the adult insects look a little like tiny cicadas, although they also might be mistaken for flies. After trying to get a photograph of one for a long time, yesterday I finally succeeded. So, have you ever seen a cixiid? 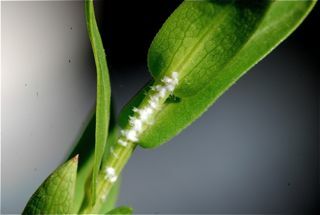 These bugs are causing a big problem in my garden, laying eggs all over the stems of my plants. How do I get rid of them? You should probably take a sample to your local Cooperative Extension office for identification and advice. Their phone number should be listed under county government. Many Cooperative Extension offices have Master Gardener volunteers who help with garden/landscape questions. Good luck!